Makeitso Somalis - Breeders of Somalis in the UK. Our foundation queen, Learoyd Amber. She had two beautiful kittens who stayed! Here is her beautiful daughter, Champion Makeitso Tasha Yar. Move the mouse over her image to see her with a kitten from her second litter. Amber’s son, Mister Data, has also done well in shows, gaining in his only two adult shows an IC and PC, both with BOB. 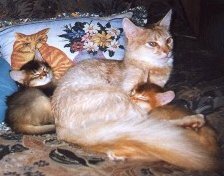 Amber had another litter of kittens and Apricot Rose stole our hearts. With no cure for this addiction, Leoncini Lysander, a very handsome Usual male came. Grand Champion Leoncini Lysander to date has 14 CC's, 3 RGCC's, 3 GCC's and had a red card day! 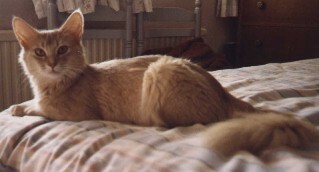 He was also the best Male Usual Adult and Kitten in 1998.
the proud mother of five! She was also Best Usual Kitten in 1999. Design by the Catbreeder team.